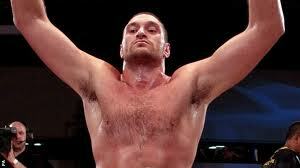 Luke Tyson Fury will fight Denis Boytsov on December 1st at the Oddessey Arena in Belfast. This is his second fight in the Irish venue and it is also Fury's first significant fight since he beat Derek Chisora last year. I'm excited about this fight and here's why. They're both unbeaten: Fury has won all his nineteen fights, fourteen by knockout. Of the two fighter's opponent records Tyson's is the best, despite his last few fights being against lower opposition. By beating Dereck Chisora in 2011 Fury can legitimately say he has beaten a top ten, borderline-top five heavyweight. Boytsov on the other hand has built up a pretty-looking thirty one wins, but his opponent's loss-to-win ratio is through the roof. His toughest fight was probably Taras Bydenko for the WBO European belt in 2009. Fury, young as he is, is actually a step up for Boytsov. It is a genuine risk: Denis Boytsov has alloy steel in his arms. He's got a knockout record of twenty five from thirty one, meaning that eight out of ten of his fights end with his opponent on the floor. Fury has already shown that if he lets his concentration lapse he is vulnerable to big shots, something that was evident when Neven Pajkic knocked him down last year. Fury admittedly has been working on his defence of late but Boytsov will be a constant danger as long as he is in the ring. The winner will be a legit top ten heavyweight: Boxrec's heavyweight top ten already has Fury at number seven and Boytsov at twenty. I think this is too generous for Fury and a little harsh on Boytsov, so really both should be from 8-14 on the heavyweight list. One thing that is certain is that the winner of this will be one of the top ten heavyweight boxers in the world. A Fury win makes Fury vs Price inevitable: If Tyson Fury beats Denis Boytsov he will be a top ten heavyweight. David Price is already in there and you can make a strong argument that he is in the top five of the division. As long as both of them keep winning and keep arguing via the newspapers, a fight between them will happen. If you agree with this then do us a favour and share it with your mates using the buttons below.